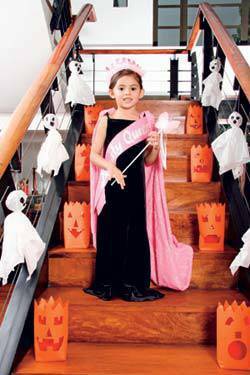 Create these easy-to-do Halloween décor with your kids! Want to come up with scary-looking additions to your Halloween-themed home? Line up your stairs and banister with your very own paper ghosts and Jack-o-Lanterns! Pull out some tissue. Crumple a bit of old newspaper or scratch paper into a tight ball (about the size of a ping-pong ball). Place this in the center of a clean piece of tissue and wrap the tissue snugly around the ball. Tie up the ball with some yarn or string. Draw on the ball portion a spooky or funny looking face, using a black marker. Whatever the look, it’s all up to you! Get your tots to join in on the fun! Lay out on a table your orange-colored art paper. On one sheet of art paper, cut out a jack-o-lantern face. You can create one with crooked teeth, or even eyelashes! Using another sheet of uncut art paper, create a paper bag shape, taping the bottoms to make it able to stand. Cut out the top of the paper jack-o-lanterns using a jagged pattern! What’s your personal Halloween arts and crafts activity? We’d love to know! Fill up the comment form below.